Key West native, Martha de Poo's love of art began at an early age through the nurturing guidance of her artist mother, Suzie dePoo (Zuzek). 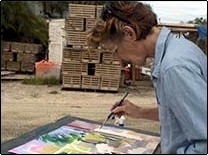 Upon graduating from Key West High School in 1973, Martha went to work at the art department of Key West Hand Print Fabrics where she rose to department head. For twelve years she received invaluable training in color and design as well as the opportunity to create numerous tropical motifs for Lilly Pulitzer. Since 1984 Martha has been a self-employed artist. She has participated in many juried shows and has won multiple awards, including first place in the Florida Keys Watercolor Society's Annual Juried Show in 2000 and 2005. Martha considers herself a lifelong student of art, and has studied fne art locally with Malcolm Ross and Sanford Birdsey. In addition, she has attended workshops with Charles Sovek, Frank Webb, Jeanne Dobie, and Tom Lynch to name a few. Her current focus is capturing the unique and fast disappearing flavor of old Key West and the surrounding keys.